Mt. Shinmoe on the southwestern Japanese main island of Kyushu erupted again Thursday less than five months after its last eruption, the Japan Meteorological Agency said. 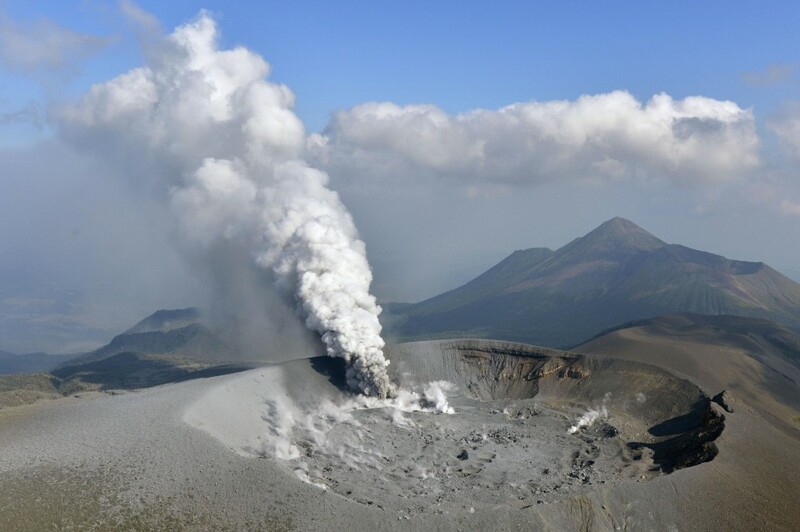 The agency confirmed a small eruption at the 1,421-meter high volcano straddling Kagoshima and Miyazaki prefectures at around 11 a.m. and ash that was spewed was observed in the town of Takaharu, located east of the mountain. Town officials confirmed the presence of fallen ash, while residents also reported seeing ash. The agency will dispatch officials to the area to probe the situation, it said. There were no reports of injuries or property damage, according to police. The agency maintained a level-3 warning, on a scale of 5, meaning "do not approach the mountain," as volcanic earthquakes have been recorded at the mountain since around 8:15 a.m. The volcano erupted in January 2011 and last October, spewing ash up to around 2,300 meters above the crater in the October eruption. After the October eruption, the agency raised its warning level from 2 to 3 and warned of flying rocks and pyroclastic flows in the area within 3 kilometers of the crater.